I had a little birthday this week 🙂 and so far I have had three separate birthday celebrations. Yay me! The first of the festivities was a whitewater rafting trip on the Nantahala River with my mother and Rob. We had a blast! The weather was perfect, the water was fast and the river wasn’t terribly crowded. The Nantahala is a dam controlled river run by Duke Energy in western North Carolina within the Nantahala National Forest. The lower run is 8 miles of class II-III rapids with names like Patton’s Run, Quarry and Upper Falls. There are several outfitters that offer guided and unguided trips, and children as young as 7 can make the run. Because the water is pumped from the bottom of Lake Nantahala, the temperature of the water is in the low 50’s all year round. In other words, it is bloody cold! It was a pretty great day all in all with my only complaint being the outfitter we used. We booked with the Paddle Inn Rafting Company, and we were all a bit dissatisfied with the service. The staff weren’t what anyone would call friendly. The place is run by a little old lady (which everyone in the joint calls mama), but she rules the place like some sort of mafia don. Actually, she reminded me of Mama Fratelli from the Goonies. She was shouting orders left and right which in fact caused more confusion for everyone if you ask me (and I guess you kind of did ask me since you are reading my blog.) The average age of employee there was somewhere around 82, which makes it a little tough for them to toss around heavy and awkward rafts. One particular employee (goes by Captain, sorta creepy in a House of 1000 Corpses kind of way), he basically yelled at me to grab my raft off of the top of the bus. I have run a few rivers, a lot of the outfitters will have you help carry the raft and paddles to and from the river, but generally, they don’t make you try and catch the heavy boats while they toss them off a school bus onto your head. Oh well, live and learn. Once we got on the river, we didn’t have to deal with Creepo-Captain anymore as we opted for the unguided trip, and we had an absolute blast. The river is beautiful, and the scenery is so peaceful, very lush and green. The three of us managed to stay in the boat the entire way down the river, although we did play a quick game of bumper boats getting slammed between another raft and a tree. Rob thought it was very funny watching my mom and I fly out of our seats. After the run, we changed into dry clothes and had a picnic lunch at one of the many picnic tables lining the river. It is a lot of fun to sit and watch the other rafters and kayakers pass by. If you forget to bring your lunch with you, there are a few places around to get a bite to eat, and Bryson City is a short drive down the mountain. The Nantahala River is a great day trip if you live close enough-only a few hours from Charlotte, and there is an abundance of cabins and lodges for rent if you need to stay a little longer. I highly recommend visiting the area if you find yourself passing through western NC. 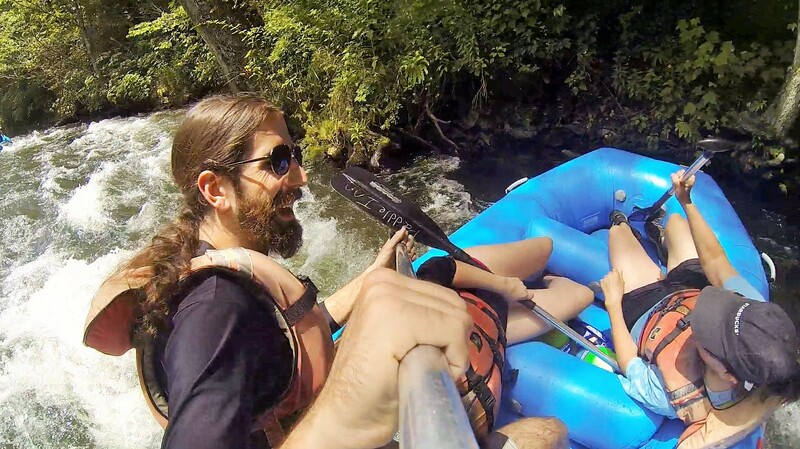 What is your favorite place to go rafting? 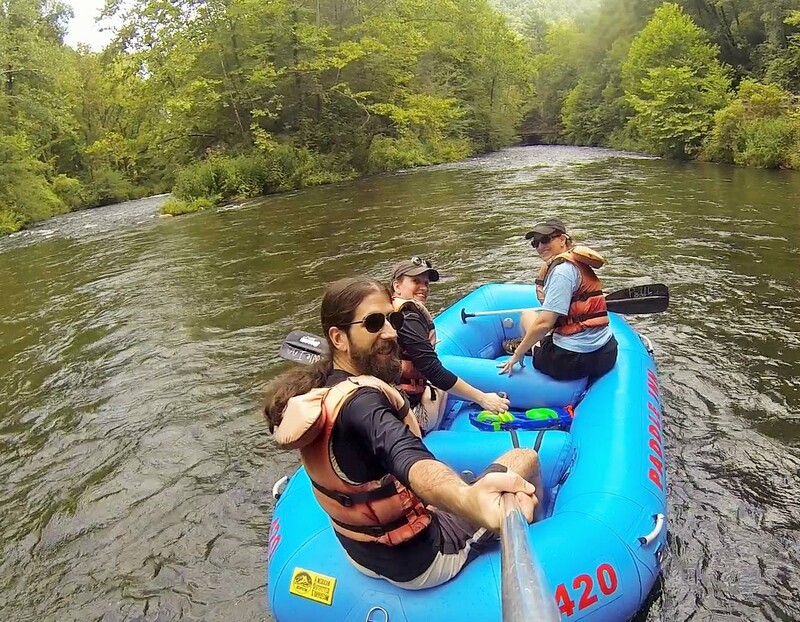 Have you ever been down the Nantahala? Unfortunately, I get motion sickness and assume that this would make me feel sick. I would love to have a go though, one day!